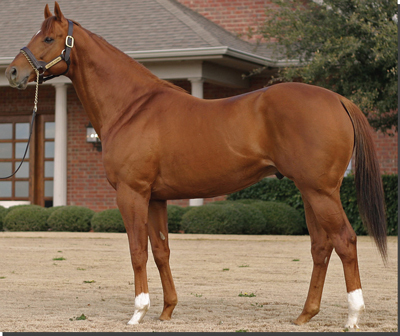 Sire of HE’S COMIN IN HOT – G3, winner of the Bashford Manor S. with earnings of $174,750. EARLY FLYER has sired 21 stakes winners and 41 stakes horses! Texas’ leading freshman, second-crop and third-crop sire, EARLY FLYER has progeny earnings of more than $9.3 million, including Texas Champions FORMAL FLYER, SWORD TRICK and Tamtastic. His recent stakes winners include BRAVURA, three-time stakes winner of $189,752, and CATTLE COMPANY, winner of the Colorado Derby. EARLY FLYER is by Champion GILDED TIME, winner of the 1992 Breeders’ Cup Juvenile (G1), earner of $975,980 and sire of G1-winning millionaires ELLOLUV, GAYEGO and MANDY’S GOLD. EARLY FLYER defeated Breeders’ Cup Sprint winners and millionaires SQUIRTLE SQUIRT and KONA GOLD, as well as top sprinters CALLER ONE and XTRA HEAT. A multiple graded stakes winner, EARLY FLYER placed in the Frank J. De Francis Memorial Dash (G1). Out of Bistra, a winning daughter of CLASSIC GO GO and dam of G2 winner and multiple graded stakes-placed FUN HOUSE. Recent runners from the immediate family include PADDY O’PRADO, WILL HE SHINE, WAR ECHO, UNTAPABLE, TAPIZAR, OLYMPIO, CUVEE, PYRO, WILD WONDER, BIEN NICOLE and CALL NOW.